Marzocchi 48mm shiver forks are valved and sprung with the AWD rider in mind. The featured Progressive Floating Piston (PFP) System allows riders to adjust spring preload/sag, high/low speed compression, as well as rebound based on conditions and style of riding. Flange M8x25 used in front fork assembly. The top and bottom triple clamps have been recontoured to remove any excess material, making the end product lighter and sleeker, knocking off 220 grams. The dropout gearboxes have been redesigned with an additional inner bearing for increased side load capacity and to promote better cooling for the brake system. The gearboxes have also been recontoured to remove excess material, resulting in a lighter, sleeker design. The new sprocket is a red anodized aluminum sprocket with an outer ring of steel teeth. This design lasts longer than an aluminum sprocket, and is lighter than a steel sprocket. The proprietary front AWD hub that houses the front driving mechanism has been redesigned to take out almost 140 grams of weight, while adding an improved internal bearing for support. Wave brake rotors are known to improve brake-lever feel. They are made from high-carbon 420 laser-cut stainless steel. A custom designed, aluminum CNC machined gas cap gives added strength and style. The cap features a laser etched CHRISTINI AWD spiral logo with a red anodize finish, and includes a one-way vent line allowing the tank to breathe while preventing fuel from splashing. 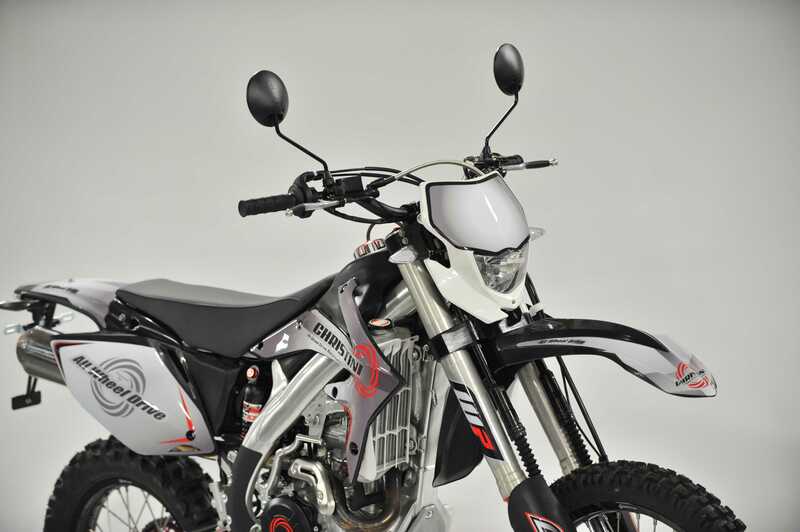 The Fox Podium RC2 Shock is custom designed for the 2013 CHRISTINI AWD 250 and 300 models. It comes with an improved Dual Speed Compression (DSC), improved spring preload adjuster, externally adjustable rebound, and a piggyback aluminum reservoir. The RC2 provides perfect course set-up every time. The aluminum exhaust with a carbon fiber heat shield offers weight savings and added protection. The Christini AWD custom radiators and hoses offer a better cooling flow and the ability to upgrade to an aftermarket fan that will keep your 2-stroke machine climbing impossible hills. This entry was posted on Sunday, January 13th, 2013 at 8:00 am and is filed under News. You can follow any responses to this entry through the RSS 2.0 feed. Both comments and pings are currently closed. Thanks for the mention! Much appreciated.